Color(s): White: There may be shading of lemon, pale orange, or ivory. Originating in Italy, the Maremma Sheepdog is a rare working breed. Their solitary function both in the past and today is that of a guardian of flock and property. The Maremma Sheepdog possesses a majestic appearance, is sturdy, and carries itself with dignity. This breed is large, well-built, and has an aloof expression. The Maremma Sheepdog breed is a true working breed and is not intended to solely be a pet. This breed is intelligent, independent, and alert. Maremma Sheepdog's are exceedingly adept as guardians of farm, flock, and family. They do well with other dogs and pets, and are extremely attentive to children. They are ever-watchful and bark constantly. Maremma Sheepdog's are loyal, affectionate, and dedicated. The Maremma Sheepdog breed must have regular brushing to remove loose and dead hair. Extra attention should be given during heavy shedding periods. The ears and paw pads should be checked often for debris. 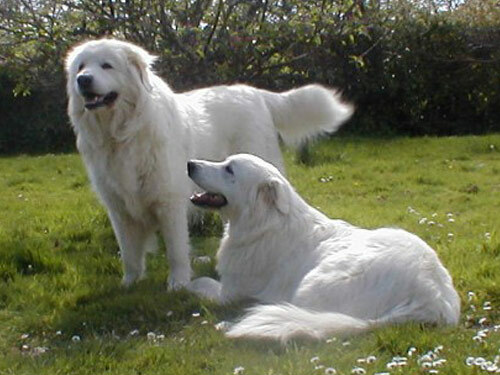 Due to their rarity and selective breeding, the Maremma Sheepdog has no known health issues. They are not suited for warm climates. This is a double coat breed. The outer coat is long, thick, harsh, and slightly wavy. The under coat is soft and dense. The coat is protective in any type of weather. This Maremma Sheepdog breed sheds heavily twice a year. Early socialization and basic obedience are recommended. Maremma Sheepdog's regards their master as an equal and a friend. They will not respond to harshness. Training must be done with respect and consistency. The Maremma Sheepdog breed is not recommended for apartment or city living. This breed requires a rural setting and an inordinate amount of physical exercise and mental stimulation. They do best with room to roam and must have a job to do.